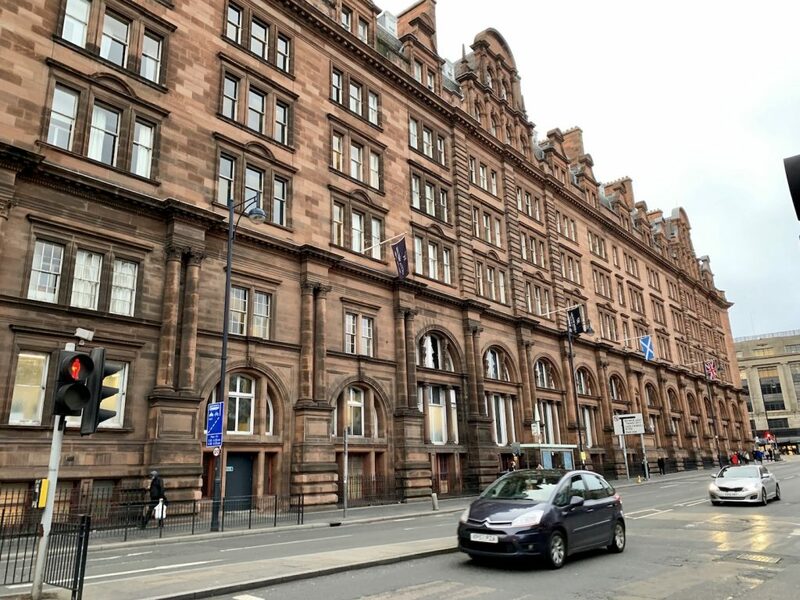 The Caledonian, the original name for Waldorf Astoria Edinburgh was built in 1903. 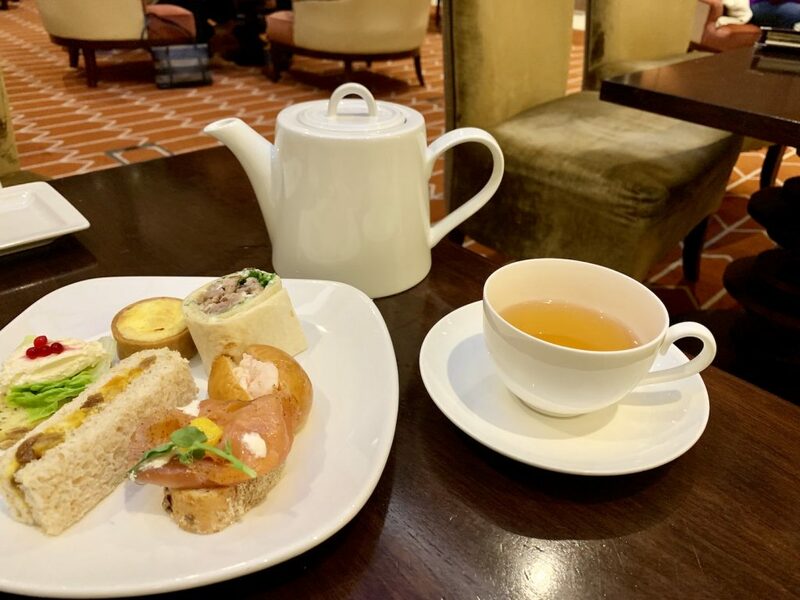 As I had afternoon tea in what used to be a Victorian station platform, I couldn’t help but imagine the fast paced energy that surrounds a major hub of public transportation. 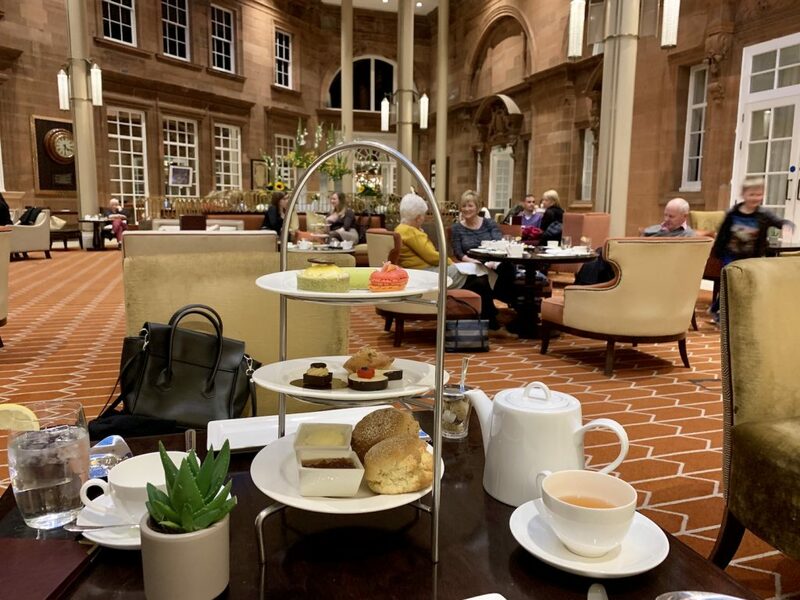 That energy is still alive in the Peacock Alley, where afternoon tea is served at Waldorf Astoria Edinburgh. 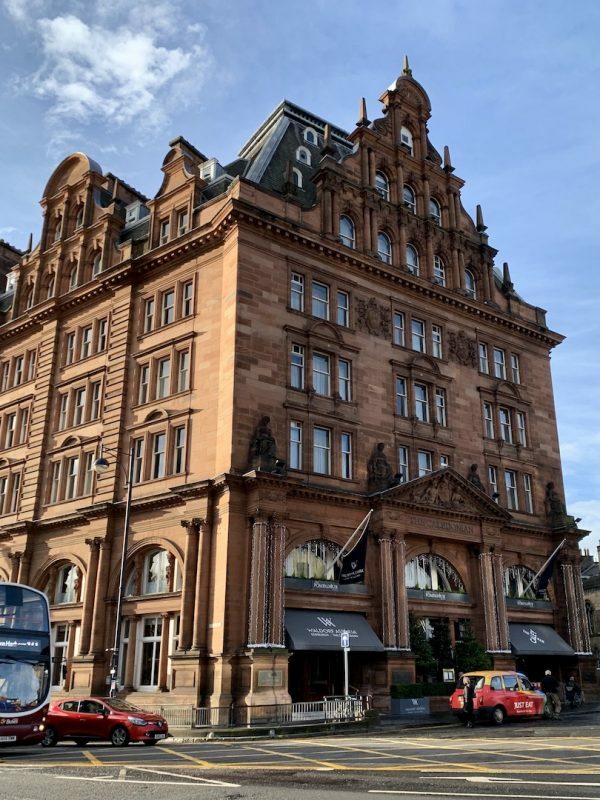 Waldorf Astoria Edinburgh is located at the west end of Princes Street – the shopping street in Edinburgh. 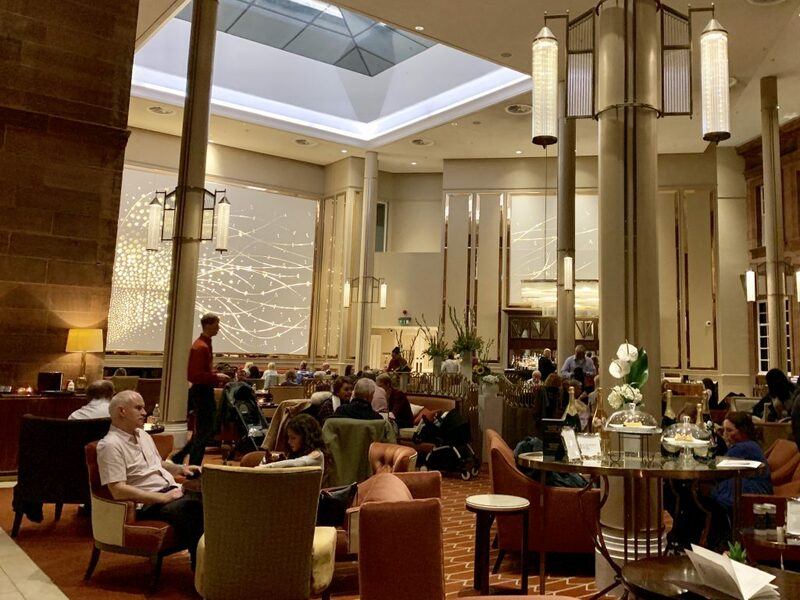 It’s in a very central location where you can easily walk to Edinburgh Castle, the Royal Mile and a majority of Edinburgh’s famous sites. Peacock Alley came about when the original Waldorf Astoria hotel, which was actually two different hotels, was connected by a corridor called Peacock Alley. 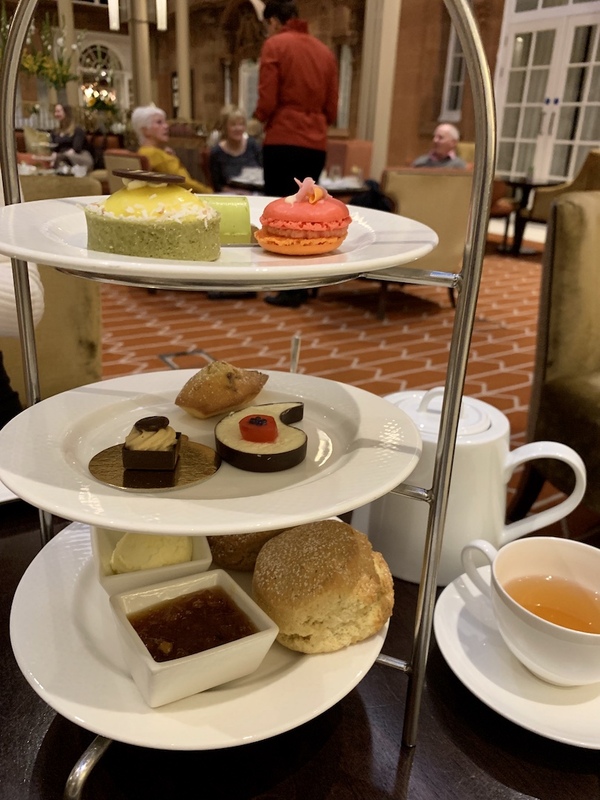 This Waldorf Astoria was no different and had afternoon tea served in Peacock Alley. This Peacock Alley in Edinburgh sits under a glass roof where you can see the historic Caledonian station clock. Since the hotel used to be a Victorian railway station, the hotel preserved the clock. On a Saturday afternoon, the whole lounge was very lively. Whole families were having tea together, and many groups looked like both tourists and locals enjoying an afternoon together. 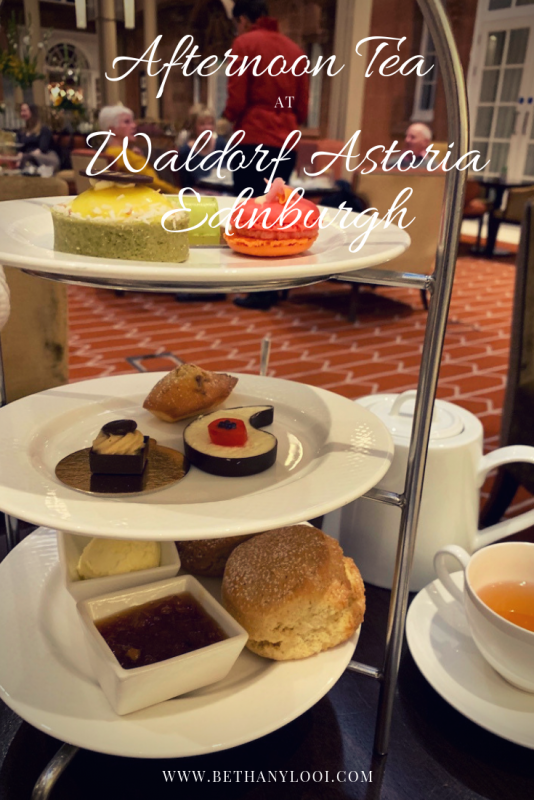 A variety of loose leaf teas are available at Waldorf Astoria Edinburgh. I went with one unique to the hotel, the Peacock Alley Blend, hand blended by Chash Tea in London. 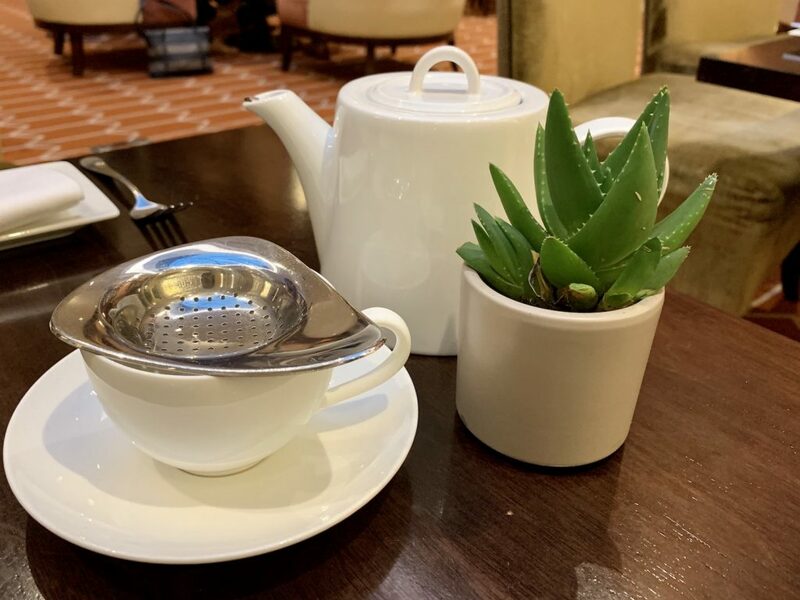 Developed for sole use at Waldorf Astoria – The Caledonian, this blend is a secret combination of more than 10 different fine teas, fruit, spices and herbs. The component we are prepared to reveal is the wonderful cornflower, a modest homage to the immodest peacock! 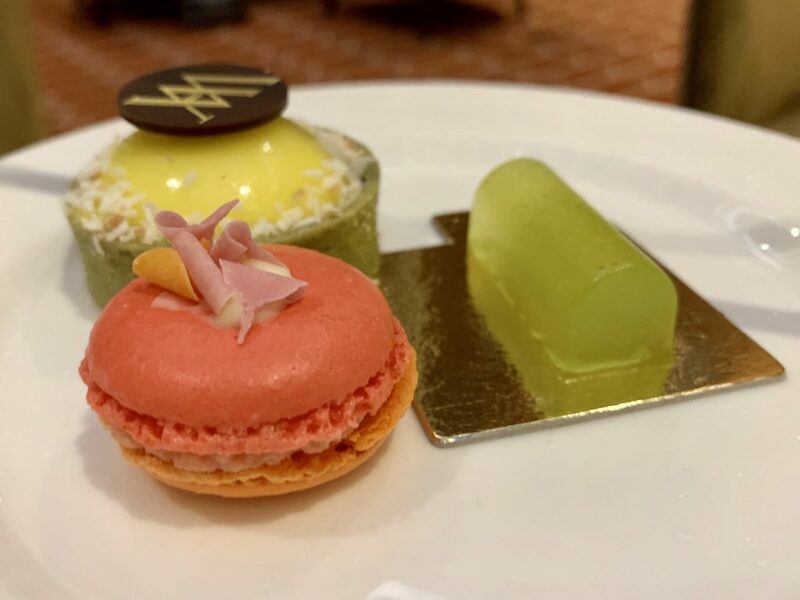 I had the Traditional Afternoon Tea package, which during my visit was the Waldorf Astoria Cocktail Afternoon Tea with a few cocktail inspired savories and pastries. 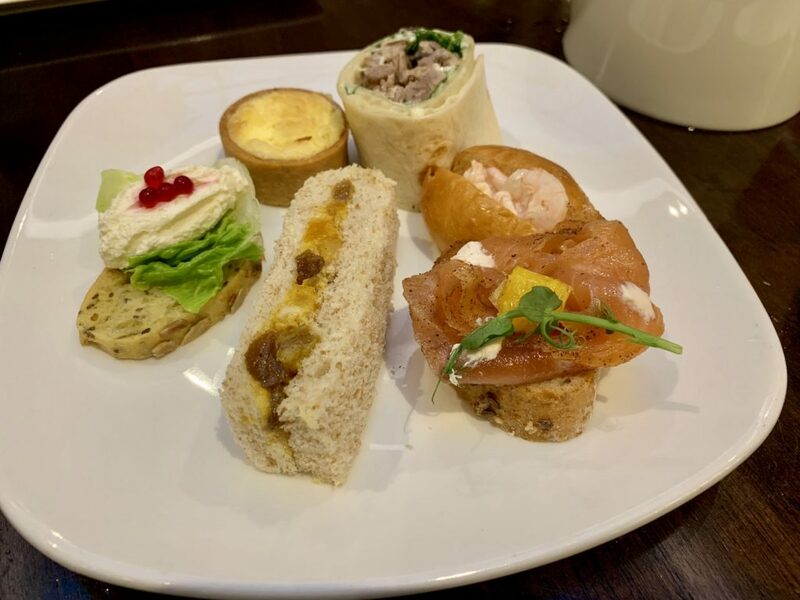 There’s also an option for Champagne Afternoon Tea and a Children’s Afternoon Tea. 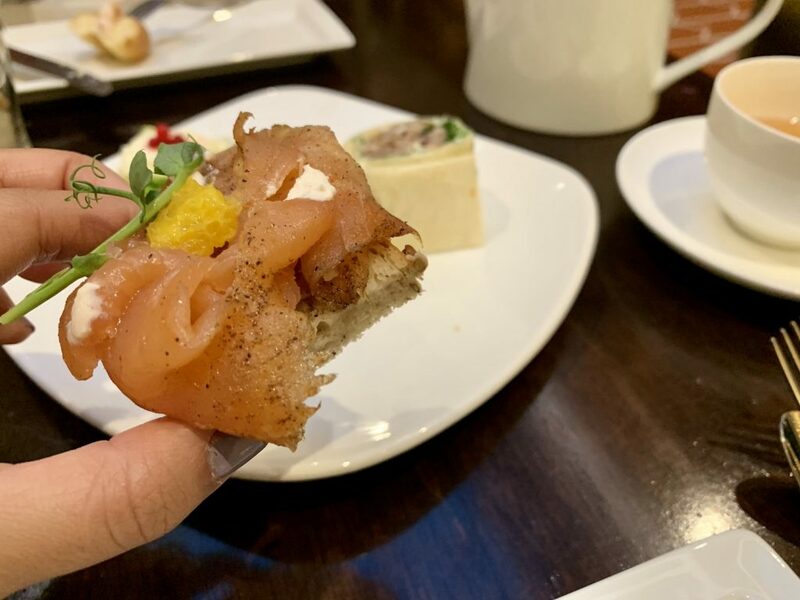 Crispy duck and cucumber wrap, Connage Crowdie (Sottish cheese), mint pickled cucumber and Pimm’s (a British liqueur) pearls, gin cured salmon with Campari creme fraiche and orange. And a coronation chicken finger sandwich, Bloody Mary prawns in brioche bun and a cheddar, onion and almond tart. A selection of plain and White Russian scones. 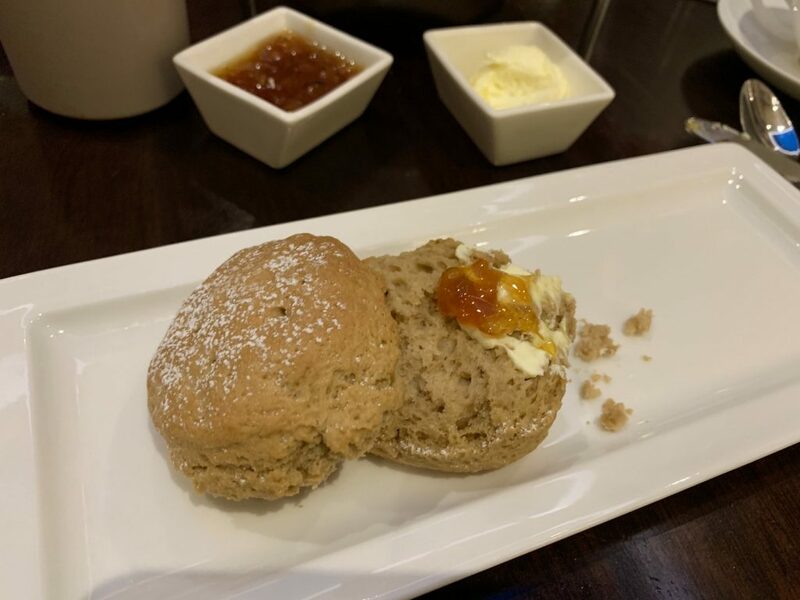 Served with conserve (like a jam, except usually made with nuts and dried fruit) and clotted cream. 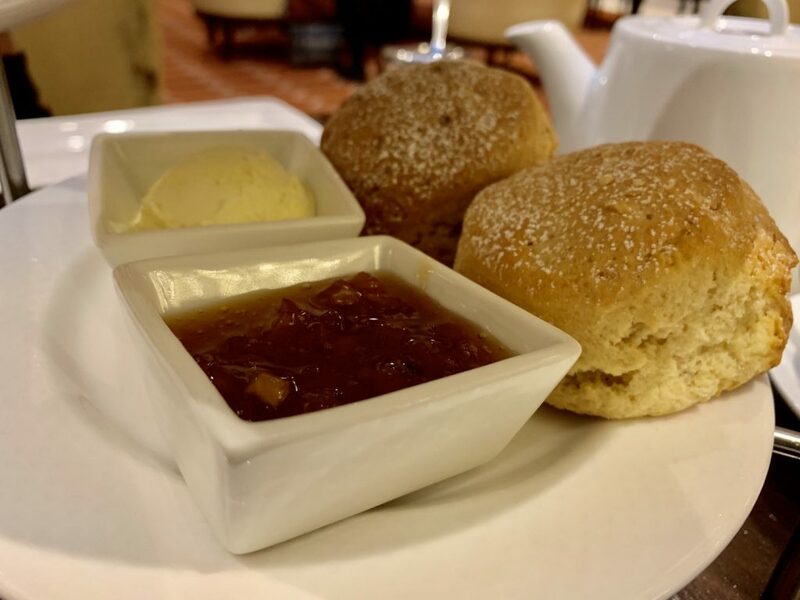 This was my first scone at afternoon tea during this trip, and I couldn’t stop talking about how good clotted cream is in the UK while eating it. Blue lagoon mousse, cosmopolitan Madeleine and black Russian cheesecake. 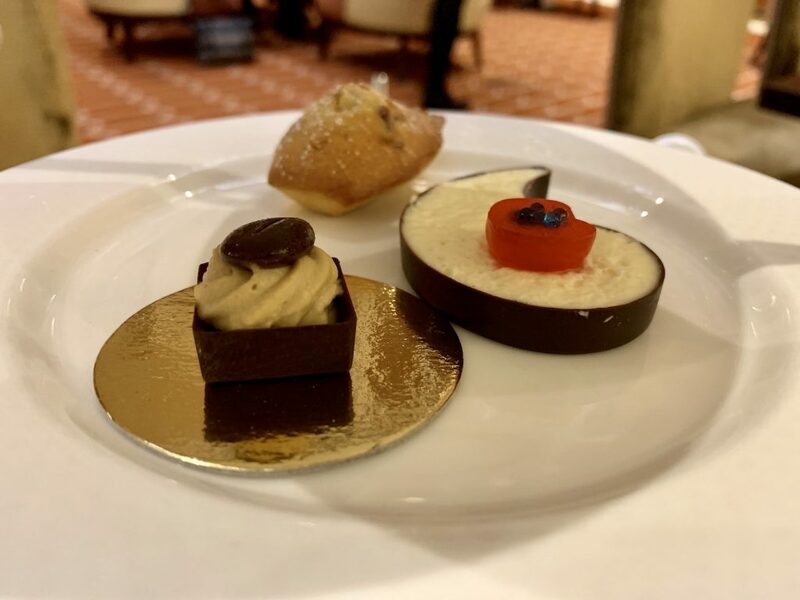 One plate had more ‘classic’ pastries, while the top tier had cocktail inspired pastries. Including a piña colada dome, tequila sunrise macaron and mojito jelly shot. Up close shot of the black Russian cheesecake. Savories were served first on a white plate. When we were finished with the savories, a three tiered stand was brought out with the scones on the bottom and pastries on the other two tiers. 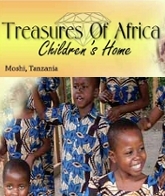 Staff were friendly and attentive. They checked on us frequently and explained all the food as it was brought out. WiFi is fast and easy to connect to. If you’re not a hotel guest, ask the server for the password, they’ll be happy to provide it. 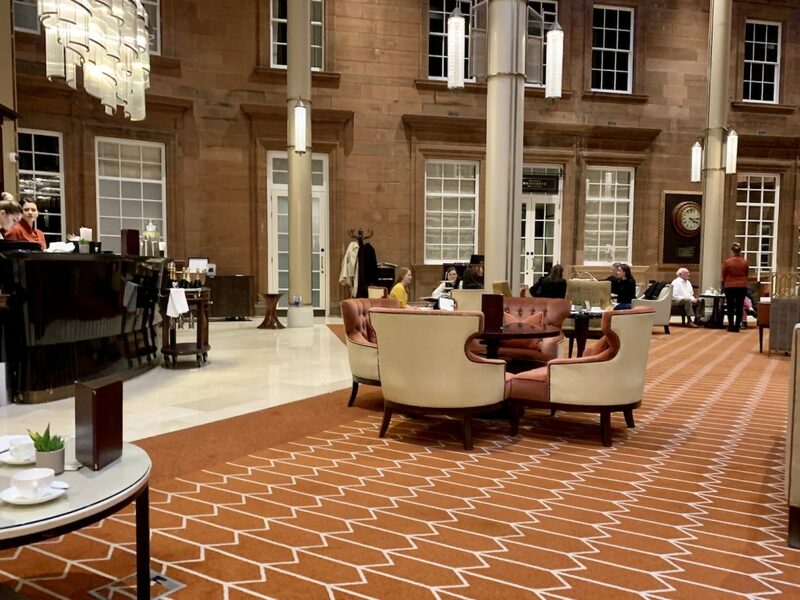 Waldorf Astoria Edinburgh is on Twitter, Facebook and Instagram. 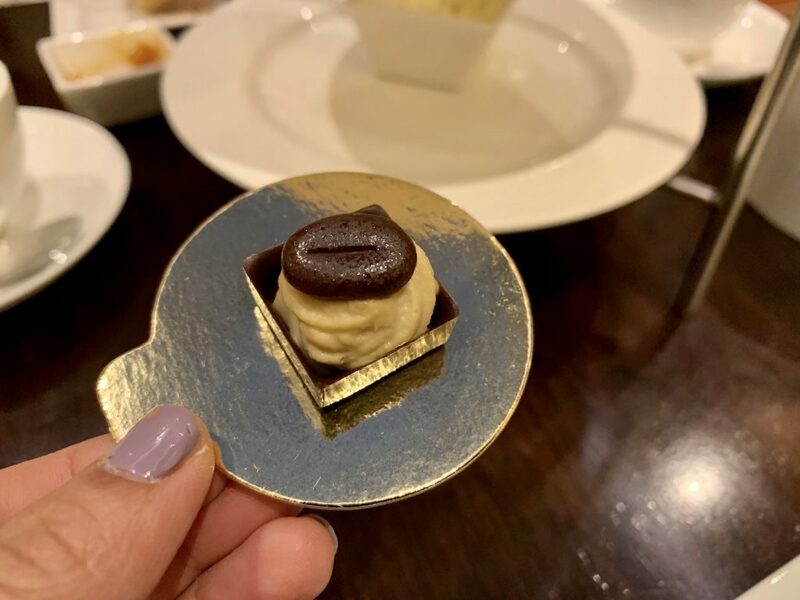 Follow them on Instagram for frequent updates and happenings around the hotel. 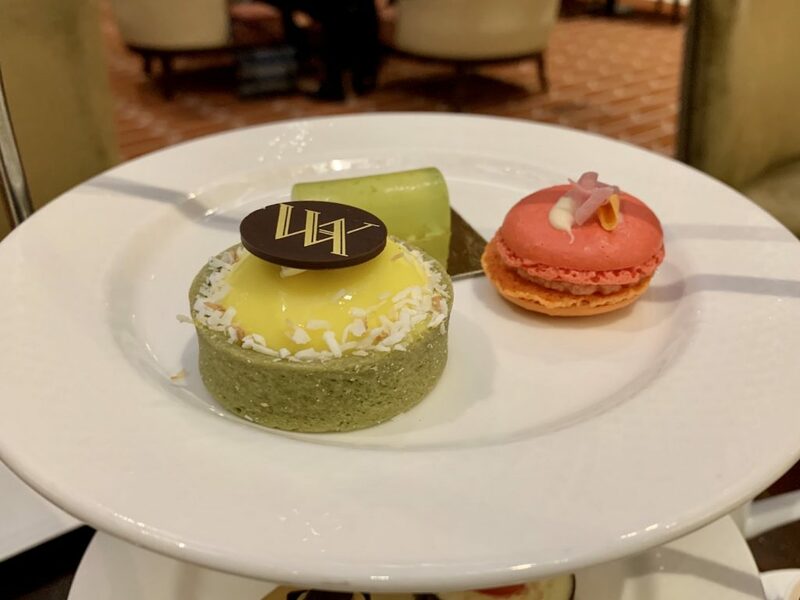 I was excited to have tea at another Waldorf Astoria property. It didn’t disappoint in terms of food and service. 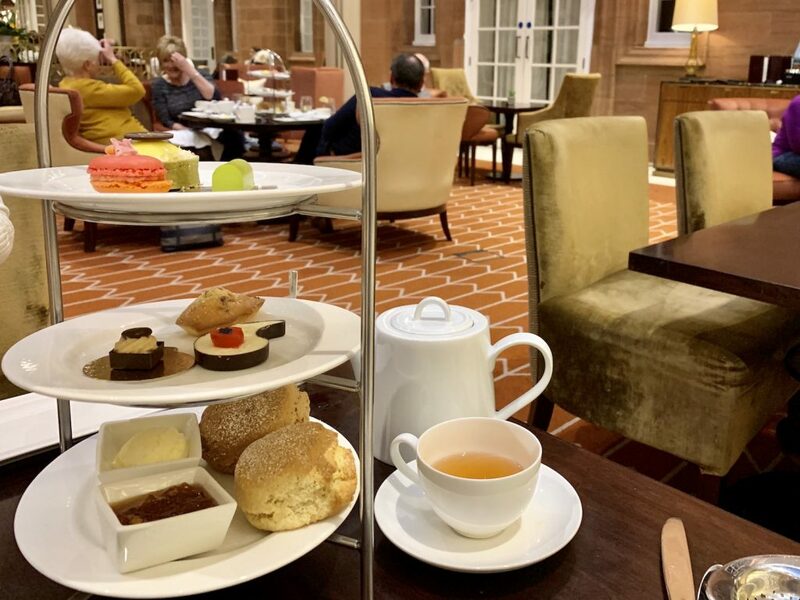 For an enjoyable afternoon tea in a lively atmosphere with a historic setting, Waldorf Astoria Edinburgh is the place to go.